Grazing must not be allowed to cause irreparable environmental damage to water quality, vegetation, wildlife habitat, and recreational opportunities on federal lands. Public agencies must protect the ecological health of the nation’s federal lands where grazing takes place. Agencies must be guided by sound scientific research to shape grazing management policies and actions. Management plans must be consistent with stated laws, regulations, and policies. Although livestock grazing is authorized under the Wilderness Act, Broads supports the elimination of livestock grazing in designated wilderness areas and encourages voluntary permanent retirement of grazing allotments. Here is a PDF of the Public Lands Grazing position statement. Americans have a deep love for our “wild west” beginnings, with starry-eyed visions of dusty cowboys aback horses, crooning to cattle scattered across wild open prairies. Yet, behind this idealized vision is an ugly history of public lands abuse, runaway subsidies, and a broken system that is impacting the health and function of our western public lands. Livestock grazing occurs on more than 250,000,000 acres of public land—that’s 57% of the lands managed by the U.S. Forest Service and the Bureau of Land Management. Improperly managed public-lands grazing is one of the most destructive uses of our precious wild public lands. Broads does not want to eliminate all grazing, but instead, advocates for management that ensures grazing practices are sustainable, allowing lands to remain ecologically diverse with healthy, functioning ecosystems. 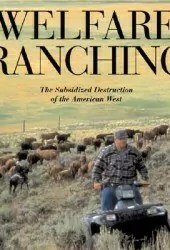 There are many arid western lands where grazing is impractical and bad for the natural and cultural resources. Policies and programs must be developed that allow agencies to “retire” grazing and to help ranchers through these transitions. This is especially important as climate change grips western lands in extreme drought and with erratic weather. Learn more about legislation that would enable this: HR3410 – Rural Economic Vitalization Act. Broads have deep roots in the arid lands of southern Utah. Our founders were activists for grazing reform in the Grand Staircase-Escalante region (now a national monument), even before Broads came into being as an organization. Poor land health and citizen outcry inspired our earliest advocacy efforts and has since been a sustained focus for the organization. Much of our approach is based upon the Tushar Allotments Collaboration, of which Broads was a participant. The collaboration grew out of an appeal on a decision made by the Forest Service to reauthorize grazing on eight allotments within the Tushar Mountains in western Utah. The Forest Service, grazing permittees, and others, including Broads and Grand Canyon Trust (GCT), developed grazing management actions to improve conditions on the ground. Those ideas, applied in Utah and elsewhere on western lands, were also part of the recommendations Broads, GCT, and The Wilderness Society made for a grazing plan option for Grand Staircase Escalante National Monument. Broads and Broadbands across the country work with agencies to gather data and monitor the effects of livestock grazing on public lands. We partner with agencies on specific projects, contribute to sensible grazing plans, and hold agencies to task on policies and enforcement activities. 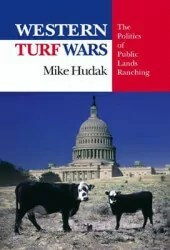 Check out our recommended reading list (below) to dig deeper into the topic and read on to learn more about the impacts of grazing. To get involved, contact your local Broadband or work with the national office to start your own monitoring project. Watch our website for action alerts and events that provide opportunities for education, advocacy, stewardship, and (of course) fun. 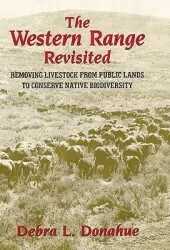 By the late 1800s, millions of cattle tromped across the seemingly vast federal lands of the U.S., injuring native vegetation, wildlife habitat, soils, and water supplies. Overgrazed western lands were the impetus for many of our national forests as local communities begged Congress for watershed protections. Yet regulation was slow to come. 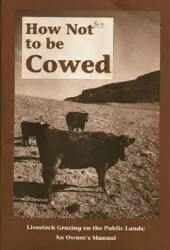 Even though the Taylor Grazing Act of 1935 was meant to address overgrazing, poorly managed grazing continued to be detrimental to our western public lands. 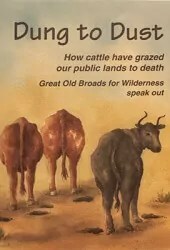 In 1964, the Wilderness Act was passed, yet public lands grazing stood fast as a concession to the legislation. Though there are continued efforts to regulate and minimize impacts, much remains to be done. The public has few opportunities to learn about existing grazing use and provide input in agency management of grazing. Cows eat what they like to eat. As a result, this selective consumption reduces the hardiness and reproductive ability of livestock-preferred plant species—often eliminating these species altogether. The less favored non-native grasses and invasive weeds thrive, altering the make up and balance of plant communities. Grazing animals also transport seed from one plant community to another and often spread non-native invasive species. All that tromping not only affects the plant life, but also the soil crust, density, and inherent ecosystem organisms that work together to create a healthy biomass that effectively holds water and prevents erosion. Overgrazed lands lose plants and expose bare soils, feeding the cycle of degradation. Mismanaged grazing transforms riparian zones into denuded mud pools, devastating water quality, hastening erosion, and robbing wildlife of habitat and clean water. Grazing on public lands requires intensive infrastructure and often results in habitat manipulation. Required allotment fences obstruct wildlife movement, changing wildlife behavior. Vegetative treatments to “improve forage” alter and sometimes decimate native plant and wildlife communities. Heavily subsidized by taxpayers, public lands grazers pay fees far below market value. The direct cost of managing public lands grazing is six times the revenue received. Taxpayers also subsidize conflicting activities such as predator control while simultaneously paying for recovery of threatened and endangered species affected by grazing activities. With the addition of other indirect costs—soil erosion, degraded water quality, and conflicts with recreation—the expenses far outweigh revenue. Too often, our land management agencies attempt to improve conditions on damaged lands and waters through expensive and sometimes destructive treatments rather than by simply removing the causal agent of the problem—livestock—and allowing nature to naturally restore. This website shows how injured lands can recover over time when grazing is suspended. Curious about grazing allotment locations and the managing agency’s assessment of the land health? Check out the PEER’s BLM Grazing Allotment Health Map. You’ll find the assessed health “on paper” does not always match true conditions on the ground.